The modem connects directly to the Internet through your ISP ( Internet Service Provider). It's typically hooked up via a phone line or cable connection. Your service provider often gives you this device for temporary use as part of your monthly charges. They may even hook it up for you and help to set it up. Sometimes you may be able to purchase this device yourself, however, with technology always changing, you must be sure to always be compatible with your service providers devices at their end. Service providers include local cable TV companies, phone companies and the like. Traditional technology such as copper lines are being replaced with optical fiber which allows much higher speeds for content download. Check with ALL local providers to see which service is best for you. 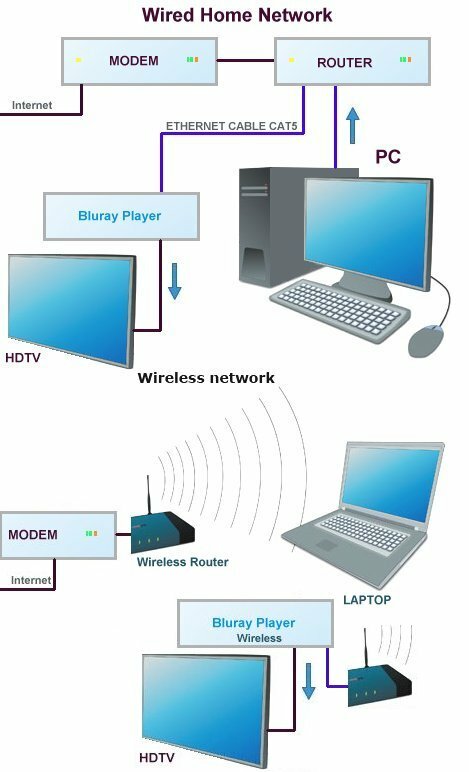 Whether wired or wireless, routers serve as the Internet access point for all your connected devices. Many also come with security features to protect you from unauthorized users. Many people purchase their router but again, it must be compatible with the modem and your PC and other devices. Many computers already have a wired or wireless networking card installed. If not, you can upgrade your computer fairly easily by adding a card that's compatible with your router. Make sure that the computers you want to connect are equipped with the right networking card, or have ports that allow you to add cards. When putting together a home network, the first thing you'll want to consider is whether you want to go wired or wireless. Wired networks use Ethernet (CAT-5 or CAT-6) cables to connect to networked components in your home, while wireless networks use Wi-Fi®, a wireless (radio signal) communications standard. The type of network that's right for you will depend largely on what you connect to it and how you want to use those devices. You want to easily move connected devices from room to room. You want the freedom to connect and disconnect additional devices at any time. You'd prefer to avoid running Ethernet (CAT-5) cable around your home. You want to connect devices that will only work with a wireless system, like a cell phone, MP3 player, or portable gaming system. You'll leave your computers and other connected gear in one location. You value the security of your system over the mobility and flexibility of a wireless system. Your home already has Ethernet cable run through the walls, or you're willing to run cables through the walls. You're looking for the most cost-effective way to install a network in your home. You may find that aspects of both wired and wireless systems appeal to you. Wireless systems sometimes run at slightly slower speed than wired networks, depending on the standard of the wireless router and cards you purchase. However, casual Internet users probably won't find the difference interferes with their web browsing and occasional downloads. Your bandwidth will determine how quickly you're able to load webpages and dowload content. If you're concerned about the speed of your connection, you'll want to check out the most recent wireless standard, 802.11n, or consider a wired system. The range of a wireless system can be up to 150 feet, though the range in your specific home will vary. Many things including appliances, building materials, and other household items have an effect on the distance wireless signals can travel. Wired systems run at a maximum speed determined by your ISP, and their range is only limited by the length of Ethernet cable you install. Some ISPs offer faster speed for additional fees so check with your Internet provider to find out if this service is available in your area. Wireless networks give you the ability to move devices connected to your home network easily from room to room. This can be especially helpful with laptops. Another feature of wireless networks is that, unlike wired networks, you aren't limited by the number of ports on your router. With a wired system, you have a finite number of ports on a router. If you use all the ports on a router, you can't connect more components to your network without buying another device. But with a wireless system, you can typically add more devices than with a common wired router. Since wired systems are connected through cables, they're relatively difficult to access without physically being in your home and plugging a computer into your router. Wireless systems pose more security risks because they send information and signals through the air. People can detect and attempt to access your network, but you can take steps to secure it. Most wireless routers come with built-in security features that are fairly simple to use. Changing the name of your network is a good way to start. Typically, the default name will be the router manufacturer's name. Change it to something else, but not something other folks will easily be able to guess. Then, adjust your router's security settings to prevent your network name from popping up when people are searching for available networks (see the owner's manual that came with your router for details). That way, folks will need to actually type in your network name, rather than just select it from a drop-down menu, in order to access your network. And if people can't find your network, there's less chance that they'll be able to connect without your permission. Your next line of defense is encryption. WEP encryption is probably the most common, though WPA and WPA2 are generally more secure. Rear panel on Router - typical connections.  Internet - The Internet port is where you will connect your cable or DSL Internet modem connection.  1, 2, 3, 4 These Ethernet ports (1, 2, 3, 4) connect the Router to PCs on your wired network and other Ethernet network devices. The SSID is the network name shared among all points in a wireless network. The SSID must be identical for all devices in the wireless network. It is case-sensitive and must not exceed 32 keyboard characters. Make sure this setting is the same for all points in your wireless network. For added security, you should change the default SSID to a unique name. Setup varies for each kind of device but generally you need some information from your ISP to setup the router and modem. There are also many user options available. Get as much help from your ISP as possible and then read the owner's manual for the router. Often it is best to default many of the setup parameters or select "AUTO". Radio Band (5 GHz) For best performance in a network using Wireless-A and Wireless-N (5GHz) devices, keep the default, Auto. Radio Band (2.4 GHz) For best performance in a network using Wireless-B, Wireless-G and Wireless-N (2.4GHz) devices, select Auto.